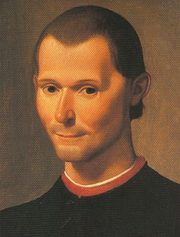 Santi di Tito's portrait of Niccolò Machiavelli, cropped. Conference "Liberty and Conflict: Machiavelli on Politics and Power"
Organized by David Johnston and Nadia Urbinati, Department of Political Science, Columbia University. between The Prince and the Discourses and the foundation of good orders; and the assessment of the meaning of political liberty and power in the study of Machiavelli’s ideas. Niccolò Machiavelli, who spent his life in political service and was a patriotic Florentine, is best known for his short work "The Prince," published posthumously. Because of this, his name became synonymous with the amoral exercise of power by political leaders -- although he was also a leading advocate of civic virtues. Machiavelli was elected to the office of second chancellor and secretary of the Republic in 1498, and served the government agency the Ten of Liberty and Peace in many management and diplomatic missions. In 1502, he married Marietta Corsini and the couple had several children. Machiavelli was removed from office, imprisoned, and tortured by the Medici family when Spanish forces invaded in 1512. He was forced into retirement and spent his time reading and writing. From 1521 to 1525, he was again employed in diplomatic services and was named the historian of Florence. In 1527, the citizens of Florentine again drove out the Medici and proclaimed the Republic -- but Machiavelli, who was in poor health, died soon after. Niccolò Machiavelli is currently considered a "single author." If one or more works are by a distinct, homonymous authors, go ahead and split the author. Niccolò Machiavelli is composed of 47 names. You can examine and separate out names.